The term "autism" refers to a cluster of conditions appearing early in childhood. All involve severe impairments in social interaction, communication, imaginative abilities, and rigid, repetitive behaviors. To be considered an autistic disorder, some of these impairments must be manifest before the age of three. The reference book used by mental health professionals to diagnose mental disorders is the Diagnostic and Statistical Manual of Mental Disorders , also known as the DSM . The 2000 edition of this reference book (the Fourth Edition Text Revision known as DSM-IV-TR ) places autism in a category called pervasive developmental disorders . All of these disorders are characterized by ongoing problems with mutual social interaction and communication, or the presence of strange, repetitive behaviors, interests, and activities. People diagnosed with these disorders are affected in many ways for their entire lives. Each child diagnosed with an autistic disorder differs from every other, and so general descriptions of autistic behavior and characteristics do not apply equally to every child. Still, the common impairments in social interaction, communication and imagination, and rigid, repetitive behaviors make it possible to recognize children with these disorders, as they differ markedly from healthy children in many ways. Many parents of autistic children sense that something is not quite right even when their children are infants. The infants may have feeding problems, dislike being changed or bathed, or fuss over any change in routine. They may hold their bodies rigid, making it difficult for parents to cuddle them. Or, they may fail to anticipate being lifted, lying passively while the parent reaches for them, rather than holding their arms up in return. Most parents of autistic children become aware of the strangeness of these and other behaviors only gradually. Impairments in social interaction are usually among the earliest symptoms to develop. The most common social impairment is a kind of indifference to other people, or aloofness, even towards parents and close care-givers. The baby may fail to respond to his or her name being called and may show very little facial expression unless extremely angry, upset, or happy. Babies with autism may resist being touched, and appear to be lost in their own world, far from human interaction. Between seven and 10 months of age, most infants often resist being separated from a parent or well-known caregiver, but these infants may show no disturbance when picked up by a stranger. Other children with autism may be very passive, although less resistant to efforts by others to interact. However, they do not initiate social interaction themselves. Still others may attempt to engage with adults and peers, but in ways that strike others as inappropriate, or odd. In adolescence and adulthood, some of the higher-functioning individuals with autistic disorders may appear overly formal and polite. They may react with little spontaneity, as if social interaction doesn't come naturally or easily to them, and so they are trying to follow a pre-determined set of rules. Some individuals with autism have normal intelligence, and many have special talents in areas such as music or memory. However, individuals with autism may have other mental or emotional problems that co-exist with their autism. Some of these other disorders may include impulse control disorders, obsessive-compulsive disorder , mood and anxiety disorders, and mental retardation . PSYCHOLOGICAL AND FAMILY FACTORS. Although Henry Maudsley, in the late 1800s, was the first psychiatrist to focus on very young children with mental disorders, it was the psychiatrist Leo Kanner who coined the phrase "early infantile autism" in 1943. Kanner believed that the parents of children with autistic behaviors were emotionally cold and intellectually distant. He coined the term "refrigerator parents" to describe them. His belief that parental personality and behavior played a powerful role in the development of autistic behaviors left a devastating legacy of guilt and self-blame among parents of autistic children that continues to this day. Recent studies are unequivocal, however, in demonstrating that parents of autistic children are no different from parents of healthy children in their personalities or parenting behaviors. In fact, many families with an autistic child also have one or more perfectly healthy children. Because autistic children can be extremely sensitive to change, any change within the family situation can be potentially traumatic to the autistic child. A move, divorce, birth of a sibling or other stressors that occur in the lives of most families may evoke a more extreme reaction from an autistic child. NEUROLOGICAL AND BIOLOGICAL FACTORS. While there is no single neurological abnormality found in children with autistic disorders, some research using non-invasive brain imaging techniques such as magnetic resonance imaging (MRI) suggests that certain areas of the brain may be involved. Several of the brain areas being researched are known to control emotion and the expression of emotion. These areas include the temporal lobe (large lobe of each side of the brain that contains a sensory area associated with hearing), the limbic system, the cerebellum, the frontal lobe, the amygdala, and the brain stem, which regulates homeostasis (body temperature and heart rate). Recent research has focused particularly on the temporal lobe because of the finding that previously healthy people who sustain temporal lobe damage may develop autistic-like symptoms. In animal research, when the temporal lobe is damaged, social behavior declines, and restless, repetitive motor behaviors are common. When measured by MRI, total brain volume appears to be greater for those with autistic disorders. Other neurological factors include lesions to the brain, congenital rubella, undiagnosed and untreated phenylketonuria (PKU), tuberous sclerosis, and Rett's disorder (a related condition in which the baby develops in an apparently normal manner through age five months, and then begins to lose communicative and social interaction skills). There is also evidence of a higher proportion of perinatal complications (complications arising around the time of giving birth) among children with autistic symptoms. These complications include maternal bleeding after the first trimester and meconium in the amniotic fluid. (Meconium is a substance that accumulates in the bowel of the developing fetus and is discharged shortly after birth.) Some evidence suggests that the use of medications during pregnancy may be related to the development of autistic symptoms. As newborns, children with autistic behaviors show a higher rate of respiratory illness and anemia than healthy children. ALLERGIES, INFECTIONS, AND IMMUNIZATIONS. Some professionals believe that autistic disorders may be caused by allergies to particular fungi, viral infections, and various foods. No controlled studies have supported these beliefs, but some parents and professionals report improvement when allergens and/or certain foods are eliminated from the diet. Viral infections of the mother, such as rubella, or of the young child, such as encephalitis, mumps, and measles, occasionally appear to cause autistic disorders. The common childhood immunization series known as MMR (measles, mumps, rubella) has recently come under scrutiny as a possible cause of some autistic conditions. 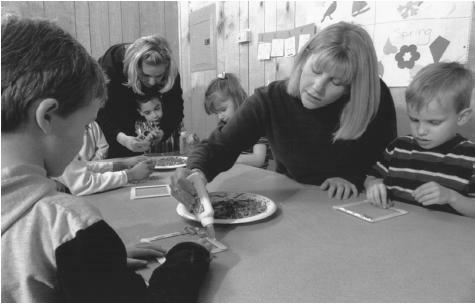 Teachers assist kindergarten students at a school for autistic children in Salt Lake City, Utah. DSM-IV-TR specifies three diagnostic categories, each with four components, that are used to make a diagnosis of autistic disorder. These diagnostic categories include impairments in social interaction, communication, and particular patterns of behavior. More information about the individual diagnostic categories and components follows. Autistic disorders strike families of all racial, ethnic, and social backgrounds. These disorders are estimated to affect approximately four children in 10,000. Other estimates place the number affected at between 1 in 500 and 1 in 2,500 Americans. Autistic disorder occurs four times more frequently in boys than girls. Several surveys have shown that between two and four percent of siblings of autistic children also have autistic disorder. This rate is 50 times greater than in the general population. Among pairs of identical twins in which one child has autism, in 36% of the pairs, the other twin has autism as well. Among fraternal twins, there is no similar correlation. Some studies indicate that even among family members who are not diagnosed as autistic, there tends to be a higher-than-average rate of language and other cognitive problems. As many as 25% of autistic children develop epileptic seizures later in life, usually during adolescence. This symptom appears mostly in those who are also mentally retarded. Recently, professionals have reported observing increasing numbers of children with autistic disorders. While no studies confirm this observation, there are three possible reasons why it appears so. First, the definition of "autism" and "autistic disorders" has widened considerably since the first case reports by Leo Kanner in 1943. The DSM-IV-TR definition currently in use includes a far greater range of behaviors than earlier definitions of autism. Second, there has been an increasing awareness of the existence of autism and autistic disorders among the general public and among health professionals, making a child with symptoms of autism much more likely to be diagnosed than in years past. Finally, it is possible that there is an actual increase in the number of children born with one of these disorders. Because young infants are so limited in their range of behavior, autistic disorders are generally discovered gradually, and rarely diagnosed before the age of two or three. Parents may not realize that their baby's behavior is different from that of other infants until he or she reaches an age where a wide range of behaviors are typically displayed. Most doctors may attempt to reassure concerned parents of infants under two years that their children are "normal," or will "grow out of" a disturbing behavior, because many children do. At the time that speech and language usually develop, parents are more likely to observe that their autistic child is not at the same level as other children his age. Once the child is old enough to play with other children, it becomes more apparent that the autistic child either isn't interested in doing so, or does so in strange, unusual ways that differ from most children of the same age. Motor development may also appear unusual, with repetitive motions such as spinning, self-injurious behaviors such as headbanging, and rocking back and forth, giving the parents strong clues that their child behaves differently from others. The child who continues to display unusual behaviors at about the age of two years would most likely receive a referral from the pediatrician to a child psychiatrist or to an early intervention program with a multidisciplinary staff including psychiatrists, psychologists, and social workers . These professionals would be the ones to diagnose autistic disorder, and, ideally, offer an early intervention program simultaneously. In order to reach the diagnosis, the professional(s) would observe the child both with and without parents present, interview the parents about the pregnancy, birth, siblings, family history, and early behaviors, and an assessment like the Bayley Scales of Infant Development might be administered. Differential diagnosis is the process of distinguishing one disorder from other similar disorders. Because there are currently no medical tests (such as a blood test) to detect autism, the diagnosis is often established by ruling out other disorders. MENTAL RETARDATION. It is estimated that approximately 40% to 60% of children with autistic disorders show some degree of mental retardation ranging from mild to profound. It is possible for a child to have both conditions. What distinguishes children with mental retardation who do not have autistic symptoms from those who do is evenness of development. Children with mental retardation tend to exhibit a more even level of functioning in all areas, whereas autistic children tend to exhibit extreme variability within areas and between areas. Children with autistic disorders show uneven development in areas such as motor, language, and social skills. A child with autism may have high-level cognitive functioning in one area, but low-level cognitive functioning in another area, for example. Or a child with autism may exhibit delayed cognitive development, but normal motor skills development. For this reason, autism is often referred to as a "spectrum disorder" because of the large spectrum or range of variability in symptoms and functioning. Also, many children with mental retardation relate well to people and enjoy social connection, which is rare for autistic children. LANGUAGE DISORDER. Children with autistic disorders may appear similar in some ways to children with language disorders. Unlike autistic children, however, children with language disorders have normal responses to most people, situations, and objects. They make eye contact and show interest in peer and adult relationships. CHILDHOOD SCHIZOPHRENIA. Schizophrenia is a disturbance of emotion and thought processes that rarely occurs in young children. When it does, it is characterized by hallucinations and delusions — seeing and hearing things that are not there, for example. These are not symptoms that appear among autistic children. DEGENERATIVE ORGANIC BRAIN DISORDER. This is an extremely rare condition that may at first appear similar to autistic disorders. In degenerative organic brain disorder, the child begins to develop normally. But over time, speech, language, motor skills and other age-appropriate behaviors disintegrate and do not return. The disintegration is progressive. In children with autistic disorders, some children may begin to develop words and language and then lose them at around eighteen months. However, with appropriate education, these skills can be relearned and surpassed by the autistic child. Autistic disorders cannot be cured, but children who have these disorders can make considerable progress in all areas of life. Depending upon the level of intellectual function, it is possible for some children with autism to become functioning, semi-independent adults capable of working and enjoy some social relationships. Parenting a child with autism can be extremely challenging, however, and many families find support groups to be helpful. Both medication and psychosocial therapies (therapies that address both psychological and social issues) can help ameliorate troubling symptoms. Education is key for helping these children learn socially acceptable behaviors, decreasing odd mannerisms and behaviors, and increasing appropriate verbal and non-verbal language skills. Most educational programs for children with autistic disorders involve small, specialized classes with teachers specially trained to work with autistic children. Often, these children are educated in special schools that have extended school years rather than lengthy summer vacations. Research has shown that autistic children need regular, daily structure and routine, and they maintain their skills best when there are not frequent disruptions of their daily school program. One method that has been used extensively both within the classroom and at home is a behavior modification method known as "Applied Behavior Analysis," or ABA. Specially trained teachers break down large goals into small steps that are taught and repeated until the child masters each one. Slowly, step by step, more appropriate patterns of behavior and communication are formed or "shaped" in this way. Positive reinforcement is used in many forms such as praise, for those children who are motivated by it, time permitted to engage in a favorite activity, or a small favored food item. For ABA to be most effective, parents need to be trained to use these same skills to continue the work at home. Although no one drug is helpful to children with autistic disorders, several medications are currently used, along with education, to reduce severe temper tantrums and destructive aggression, self-injurious behaviors, hyperactivity, and strange, repetitive behaviors. Medications may also help the autistic child become more receptive to learning and relating to others. Some of the medications commonly used today include risperidone (Risperdal), and haloperidol (Haldol). Although there are side effects associated with these medications, careful dosing and use of other medications to counteract side effects often enable the autistic child to function more effectively. One non-conventional and experimental treatment for autism is the use of secretin, a hormone produced in the small intestine that stimulates the pancreas to release sodium bicarbonate and other digestive enzymes. Some researchers think that children with autistic disorders do not produce enough of this hormone, and that the lack of sufficient secretin may be the reason why children with autistic disorders suffer so frequently from digestive problems. There are some reports of treating autistic children with secretin that indicate improvement not only in digestion, but in eye contact, alertness, and the ability to learn. Another non-conventional, experimental treatment involves Candida albicans , the technical term for a common yeast that is found in the human body. Some scientists believe that an overgrowth of this yeast may cause or worsen autism. Some reports indicate that children treated with anti-yeast medications improve in eye contact, social abilities, language skills, concentration, and sleep, and that they show a reduction in aggressive and hyperactive behavior. An additional non-conventional treatment being researched for autism is a nutritional supplement, Vitamin B6. Some experts believe that Vitamin B6 holds promise for reducing autistic symptoms and helping autistic children progress in all areas. It may be combined with magnesium and the combination appears to have no known side effects. Improvements attributed to these supplements in some studies include enhanced language, eye-contact, and behaviors, as well as more normal brain activity and improved immune system functioning. These treatments remain outside mainstream medicine, however, and research is ongoing as to their efficacy. Parents interested in these therapies may wish to discuss them with their child's health care team. Autistic disorders follow a continuous course throughout life. Autistic individuals with higher levels of intelligence may become able to work and live independently or, more frequently, semi-independently. This is especially true for those with IQ scores of 70 or higher. One in six children with autism becomes a well-adjusted adult. Another one out of six achieves a fair degree of adjustment in adult life. Others may never be able to leave the structured environment of home or, later, special group home placement. During adolescence, sexual feelings emerge that cannot usually be handled appropriately by the autistic teen. Supervision throughout life is needed for the majority of individuals diagnosed with these disorders. At present, no specific means of preventing autistic disorders exist. Because of an elevated likelihood of giving birth to more than one autistic child exists, genetic counseling is recommended. American Psychiatric Association. Diagnostic and Statistical Manual of Mental Disorders. 4th edition, text revision. Washington, DC: American Psychiatric Association, 2000. Hamilton, Lynn, Facing Autism. Colorado Springs, CO.: WaterBrook Press, 2000. Kaplan, Harold, MD, and Benjamin Sadock, MD. Synopsis of Psychiatry. 8th edition, revised. Baltimore, MD: Lippincott Williams and Wilkins, 1998. Powers, Michael, Psy.D., ed. Children with autism: a parent's guide. 2nd edition., Bethesda, MD. : Woodbine House, 2000. Wing, Lorna, M.D. The Autistic Spectrum. Berkeley, CA. : Ulysses Press, 2001. American Psychiatric Association. 1400 K Street NW, Washington, D.C., 20005. Autism Network International, PO Box 448, Syracuse, NY 13210-0448. <http://www.students.uiuc.edu/bordner/ani/> . The Autism Society of America. 7910 Woodmont Avenue, Suite 300, Bethesda, MD 20814-3015. <http://www.autism-society.org> . Families Working Together. 12400 Cypress Avenue, Space 20, Chino, CA 91710. <http://www.ucddfam.com> . F.E.A.T (Families for Early Autism Treatment). PO Box 255722, Sacramento, CA 95865-1536. <http://www.feat.org> . It is an excellent post on autism covering almost all sides of the developmental disorders. It is well researched and well written. The post is full of much unique information. Thanks for such nice writing.